Welcome. 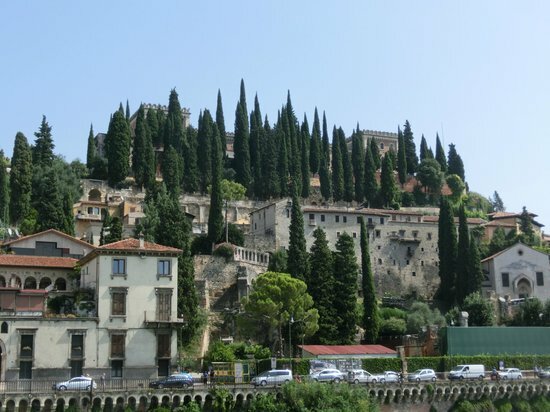 I am delighted you could make it to the place which is home to the most powerful love story in western culture: the gorgeous World Heritage Site of Verona. A couple of years ago I was walking through the center of this splendid ensemble of urban architecture, with an old friend of mine who had never visited before. Suddenly she stopped and told me one of the most beautiful things I have ever heard about Verona: "In this city I feel like I'm on a movie set." Over three days, I took her on the exact same route I'm going to lead you on in this guide. 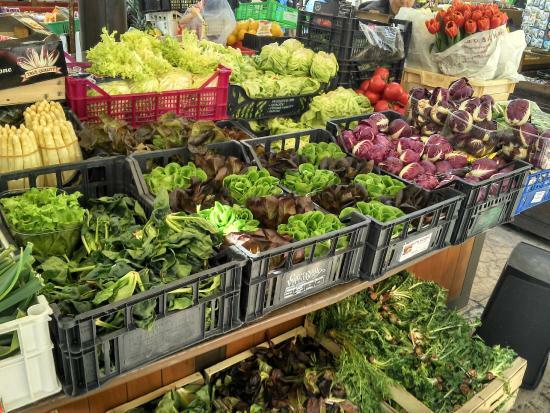 So get ready to fall in love as we explore with wonder, eat well, and taste some excellent Amarone wine - you might never want to leave Verona! 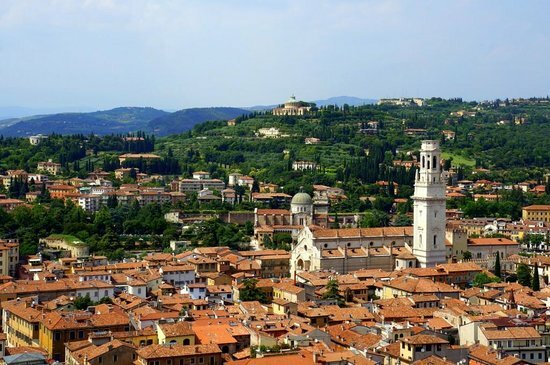 Verona is home to the famous Amarone, a typically rich Italian dry red wine. A bottle is pretty expensive, but do not miss the chance to order a glass of it while you are here. Try to avoid taxis, they are pricey and distances between sites of interest are short. 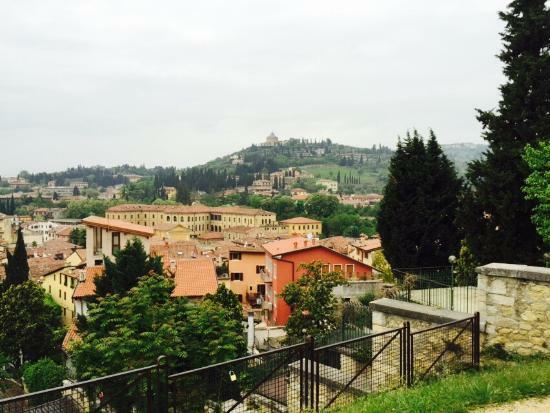 If you buy the Verona Card you will get free city bus travel, otherwise walking is your best and most scenic option. Tipping is not done by most Italians and you shouldn't feel compelled to do it either. 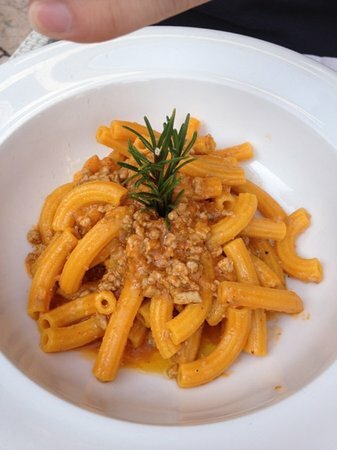 If "Coperto" is written at the bottom of the menu, this means that an automatic fee is added to your bill. Buy the Verona Card and enjoy your visit without paying multiple entrance fees to the most important sites. On top of this, you also get free city bus travel! Our journey starts in Piazza Bra, the second most important square in the city, and home to the world famous amphitheater, Arena di Verona. After its birth in the first century AD, the Arena went through a series of transformations, as it was used for several different purposes. 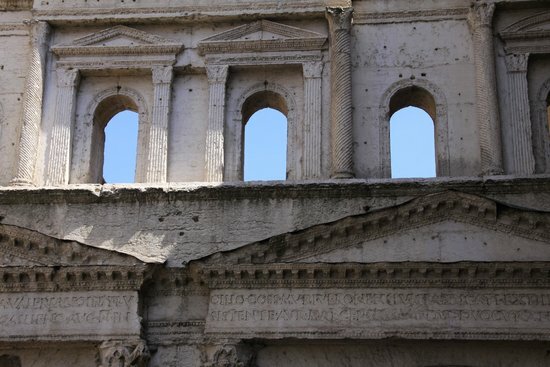 There was a time when the Roman amphitheater was the place where prostitutes had their headquarters, only to be transformed into an area for selling fruits and vegetables some years later. The first opera concert ever held here was by Verdi, and since then, the Arena has possibly become the most famous place in Italy for opera singers to perform (after La Scala di Milano). The oldest open-air opera festival in the world is held here every year from June through September. The Arena not only hosts opera, ballet, and symphonic concerts. Famous rock stars from all over the world also come here to sing, so check out the schedule before arriving! 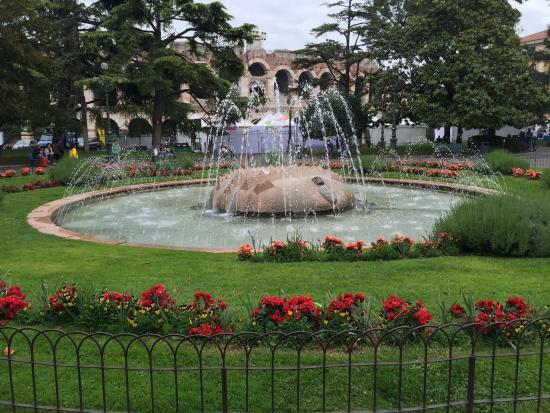 A city tour aboard a fancy little train (“Trenino Turistico”) starts in Piazza Bra, just by the fountain. It costs less if you have the Verona Card. 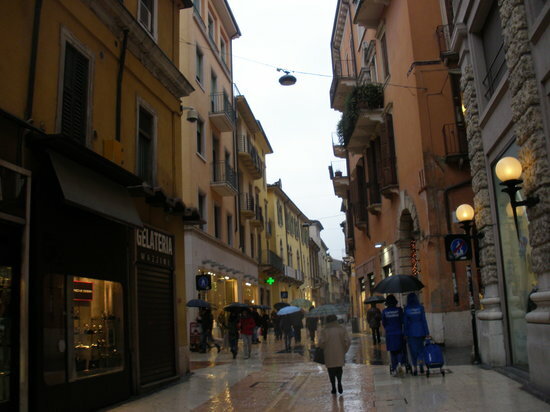 All eyes on Via Mazzini now, the most fashionable street in Verona, housing the poshest shops and the biggest theater in town. 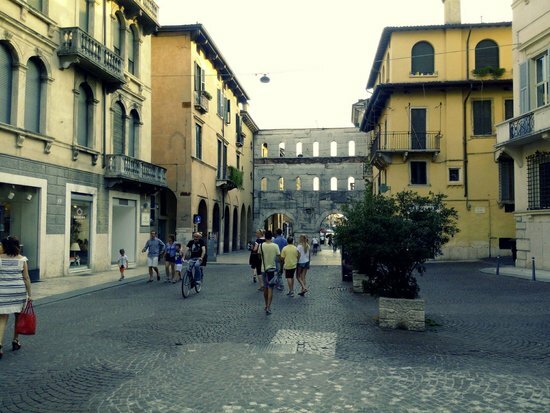 The street takes its name from Giuseppe Mazzini, one of the most important people to have contributed to the unification of Italy, and there may be no coincidence in the fact that it links the two major squares of Verona: Piazza Bra and Piazza delle Erbe. In this large pedestrian area, you can find luxurious shops and numerous souvenir stores, while the street artists are likely to entertain you with their unique talents. Should you wander into the back alleys, you might also discover some typical bars and pubs, where you can quench your thirst with a tasty Italian aperitivo. 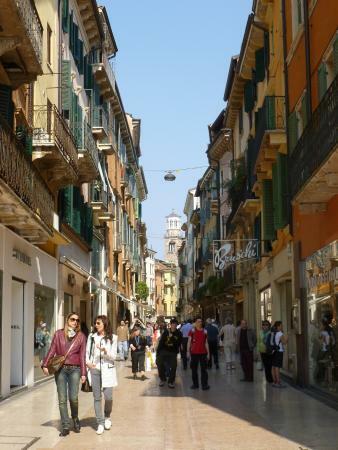 Even though this shopping street is mostly high-end, if you come to Verona during the sales you will find some serious discounts here. A lot of shops also offer a discount just before the sale period starts, especially if you put on your best smile and ask! Try to take your eyes off all the elegant shops and look up. You will see colorful windows and decorated balconies, delightful window blinds, and tasteful architecture. If you’re here for the shopping, Al Duca d’Aosta is the poshest shop around, representing everyone from Burberry to Gucci to Givenchy, along with other chic names. If you're planning to ask for a discount, make sure to mention that you're asking "in view of the upcoming sales." However, you can only do this a couple of days before the sales, not 2 weeks in advance. After reaching the end of Via Mazzini, we find ourselves at a crossroad. 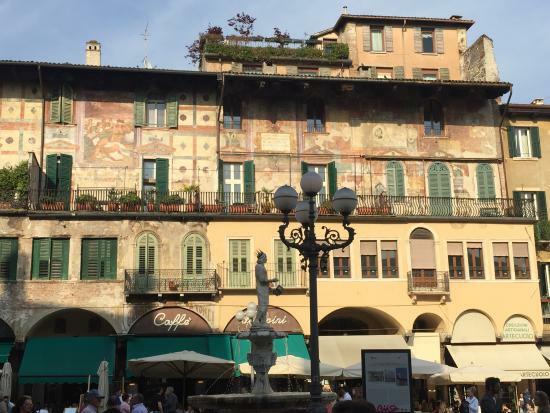 Here, we turn left into the amazingly elegant Piazza Erbe, with its imposing tower, and lively cafes and bars that celebrate the old buildings above them (on which beautiful frescoes still reign). 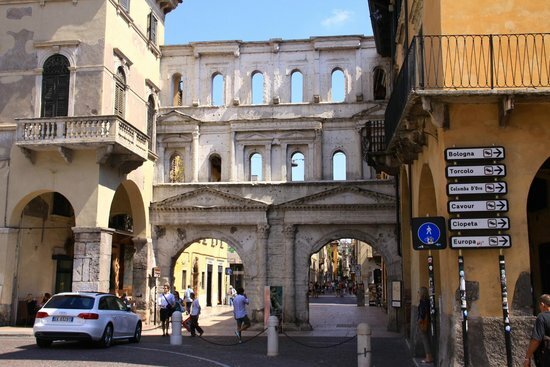 Some of Verona’s oldest buildings are situated here, as this was the most important gathering place for political and economic life during ancient times. 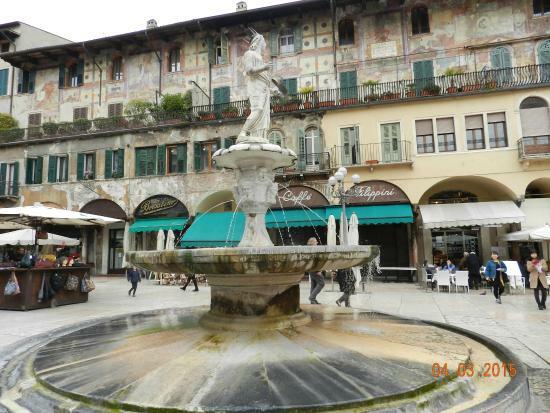 In the center of the square, you can admire the Madonna Verona fountain, which consists of a beautiful Roman statue with an epigraphy dating from the IV century. 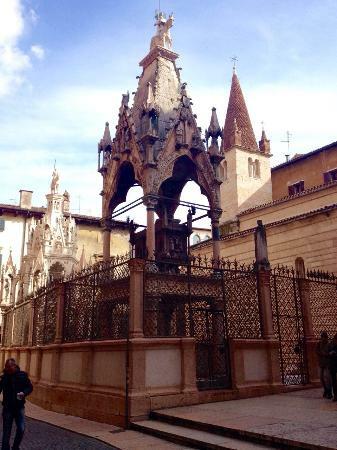 Just next to the Madonna Verona fountain, you will also notice a covered square pavilion, boasting a strange giant handcuff and some geometrical forms beneath it. 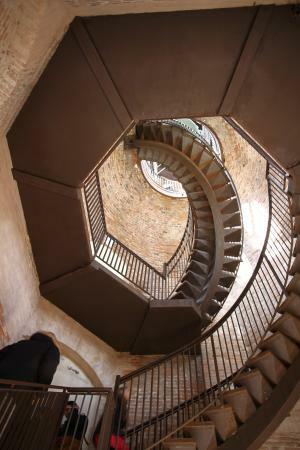 This peculiar structure is one of the best-kept secrets of Verona and few people know exactly what purpose it truly served. 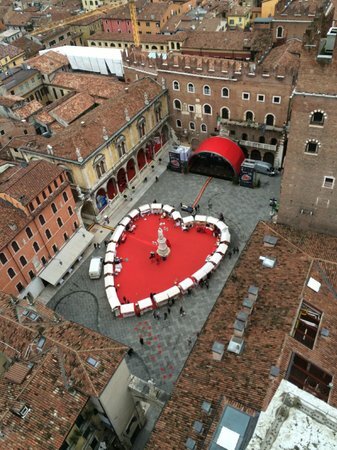 Contrary to the popular belief that this used to be a place for handcuffing and torturing people, this was actually the heart of Verona’s commerce. People used to get on top of the pavilion and try to sell their merchandise (mostly raw materials, like wood or stone) to anyone interested. In order to prove that their logs of wood were the width they claimed, they used to slip them through a metal cuff which was a standard measurement. The same thing was done with bricks and roof tiles that had to fit the dimensions of the geometrical forms, which you can still see today embossed in the lower part of the edifice. The head and the arm of the Madonna statue were missing and were therefore added later in 1368 when the fountain around it was built. Look closely and try to notice the differences. 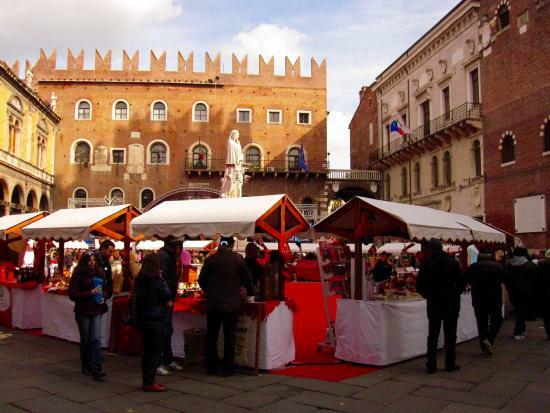 Since Piazza delle Erbe literally means "herb market," make sure you taste some local flavors from the various vendors that line the square. 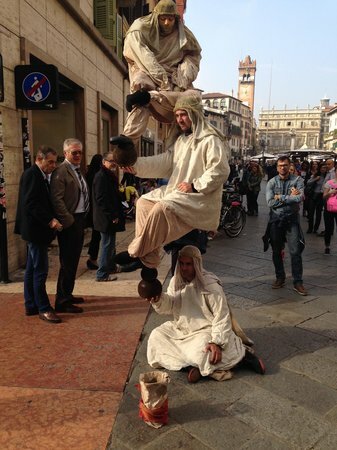 Enjoy a glass of wine and mingle with the Veronese people when the square comes alive late afternoon. 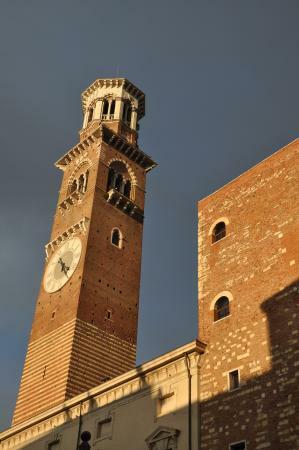 This is a medieval tower that you cannot miss once you are in Piazza delle Erbe. It measures 83 meters (272 feet) in height and dominates the historical center of the city of love. At the beginning of the 1700s, the clock was added to the tower, most probably because the previous mechanical clock, which reigned on top of Torre del Gardello (South-West angle of Piazza Erbe,) had stopped working. Have a different experience and take the steps instead of the elevator. Once up there, you will have a beautiful panorama of the whole city, and with a bit of luck you will even be able to see the mountains. 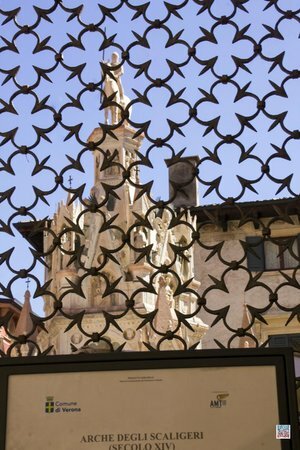 If you happen to visit Verona around Valentine’s Day, Juliet's House and Juliet's Tomb grant free entrance to visitors on the weekend preceding February 14. 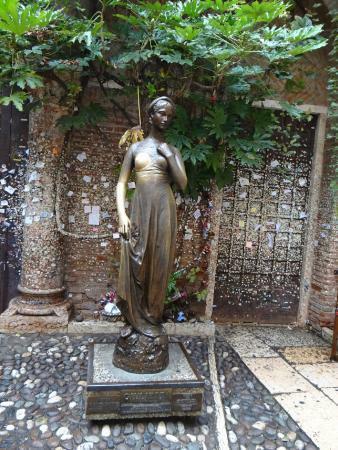 You need a ticket in order to visit the house but you don’t need anything to visit the courtyard, Juliet’s statue, or write love messages. Sometimes, love really is free. If you are ready to take the big step, it is possible to get married inside Juliet’s house. Bookings can be made at Verona’s City Hall. 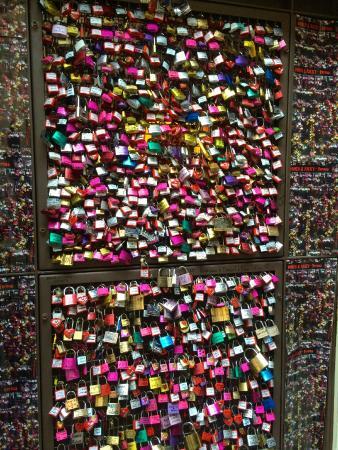 Inside you can admire Romeo’s and Juliet’s costumes from the famous Franco Zeffirelli movie. The featured bed is also from the original set used in the motion picture. Romeo’s house is just around the corner and although you can walk to it and take some photographs of the inscription, you cannot visit it inside, as it is private property. 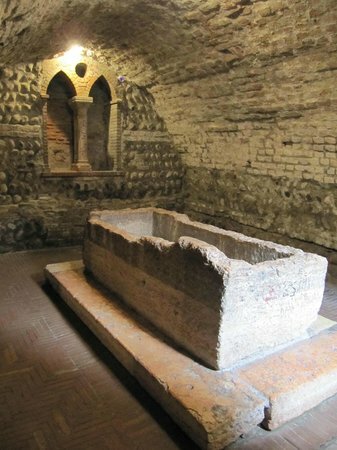 Juliet’s balcony is, in fact, an old sarcophagus. It did not belong to the original house and was added in the 20th century. Sometimes, love really hurts. 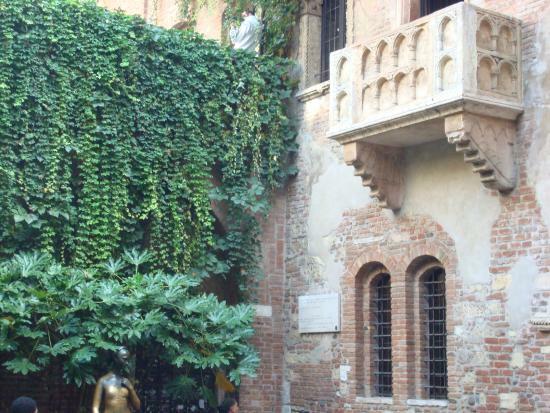 Juliet’s house was owned by the family dell Capello — is it just me or does that sound very similar to Capulet?! Just after you pass the iron gates at the entrance, you will notice a small entrance to a hotel on your left. 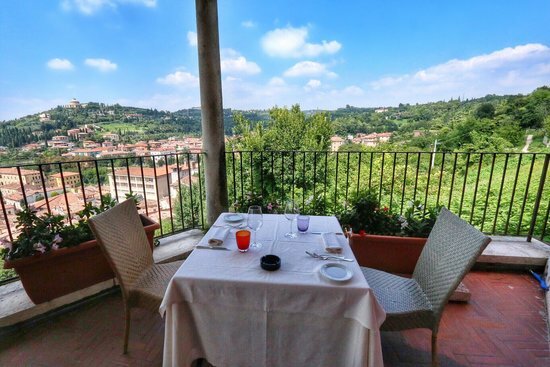 This is 'Il Sogno di Giulietta Hotel' (Juliet’s Dream,) one of the most romantic places to spend the night, boasting rooms that overlook Juliet’s house and balcony. 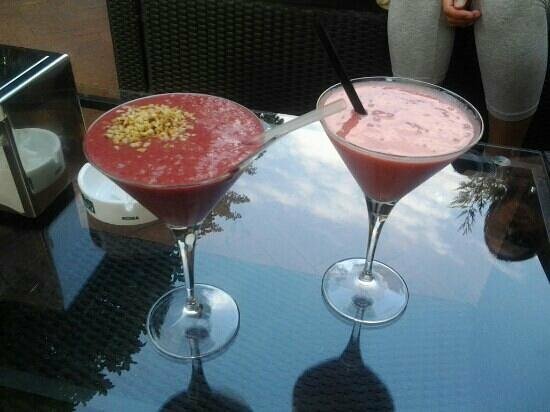 Our day is coming to an end and we will end it in style by having a drink and something to eat at Mazzanti's. 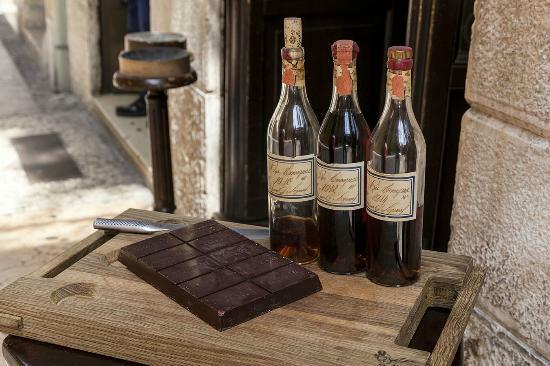 This place is just great for anything you could possibly be in the mood for, from a multiple course menu to a traditional Veronese Spritz Aperol to a simple hot chocolate. It is one place where I never been met with a dish I didn't like! Quite frequently, Casa Mazzanti hosts concerts and screens important football games in the evening. This could be your next favorite place to support your favorite team! The terrace becomes really crowded in the evening, especially during summertime, as many young locals come here to socialize and have a glass of their favorite aperitivo. 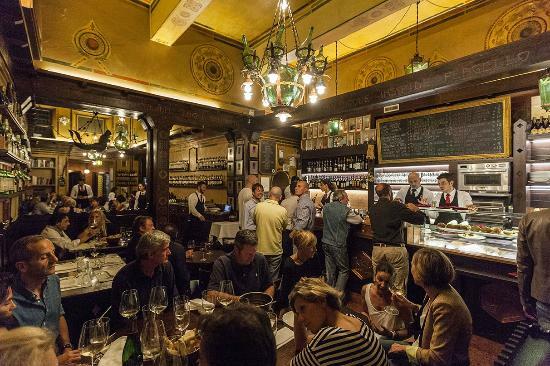 You will notice that there are often not enough tables for everyone, but ordering at the bar and then holding your glass while standing and waiting is very common here. Take a chance and mingle! Just next to Piazza delle Erbe, look up and you will notice a whale rib pertruding from the arch that marks the entrance to Piazza dei Signori. The Lodge of Consiglio is the most important building here; a Venetian Renaissance palace unique in Verona, it's neo-classical in design and was built in the second half of the 15th century. The statue of Dante is now in front of us, erected as an initiative of the Academy of Agriculture and the Society of Fine Arts and uncovered on 14 May 1865. 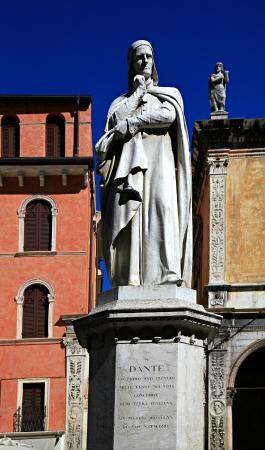 Dante wrote a very big part of the Divina Commedia in Verona, but left the city one year before his death. This square is particularly beautiful in winter, as it is where the Christmas Market is located. I personally like to call this place "the square of myths." Legend says that the whale rib will not fall down until the first person to have never told a lie walks under it. Are you the one? Just to the right there is the old tribunal with the old prison right behind it. In the past, when someone was found guilty, the prison was waiting for them just across the hallway! 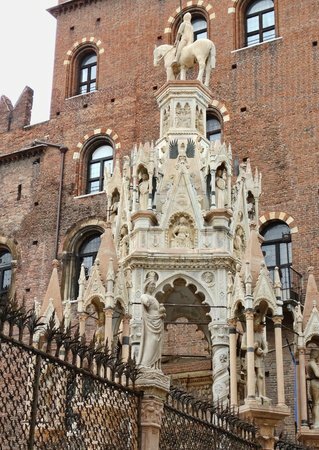 Close to the tombs, you can actually see a 500-year-old iron gate with the ladder symbol on it: Verona's symbol. 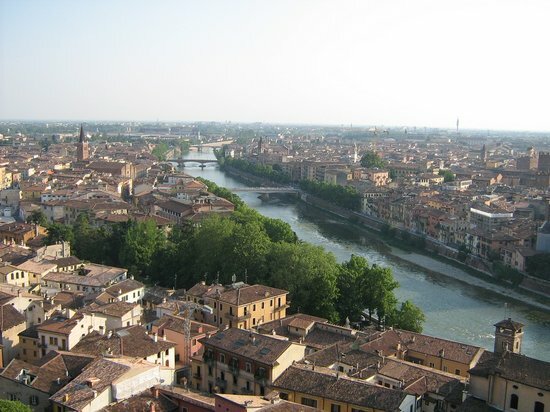 Verona is also called "the ladder city" which in Italian is "citta scaligera." 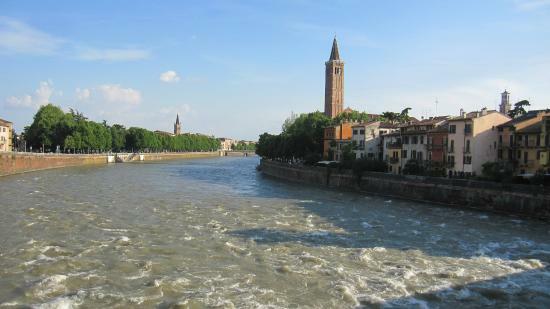 Next stop is Ponte Pietra, a beautiful Roman arch bridge over the river Adige, and the oldest bridge in Verona. From here one can see the hills surrounding the city and the actual place where the original inhabitants of the city first set-up camp and built their houses. On one side of the river, you'll find the inscription, 'Irene, io e te, tre metri sopra il cielo.' This means 'Irene, you and I, three meters above the clouds,' which comes from a scene in a famous love story by the Italian author Federico Moccia. Having just made love, the girl tells the boy how happy she is, and asks him if he feels the same. He replies: 'No. I am not happy. I am more than that. I am three meters over the sky.' Since its publication, adventurous lovers all over Italy have been writing this message wherever they think it easiest for their better halves to read it; places like bridges and high city walls. For the adventurous traveler, the Adige river is used for rafting in summer and sometimes you can see the boats pass under Ponte Pietra. Four arches of the bridge were destroyed in World War II and later rebuilt using original materials. Pay attention and you can see the oldest part has a totally different stone color. 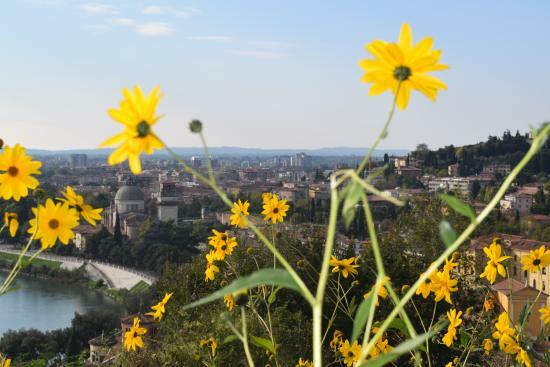 It is from here that one can also admire the ancient Roman Theater and the San Pietro Castle on top of the hill. 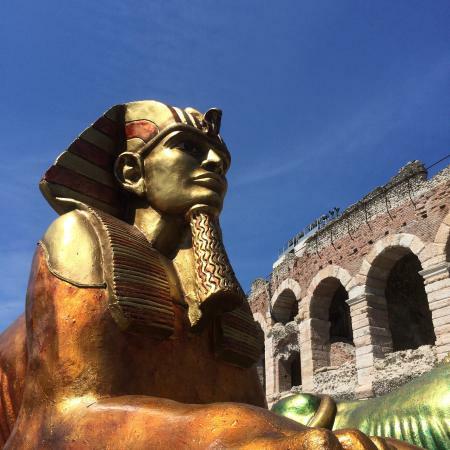 Verona’s Roman Theater is considered to be the most important Roman theater in Northern Italy and is the oldest structure in Verona. 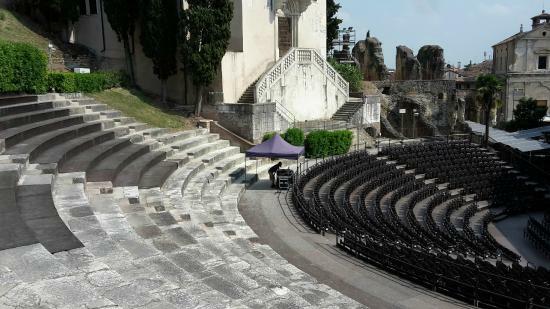 It was built in the 1st century BC, taking advantage of the natural inclined slope rising from the land beneath the hills, just like the Greeks used to build their terraces before the Romans (flat stage and terraced audience.) Inside the archaeological museum you can admire gorgeous mosaics, Etruscan and Roman sculptures, Greek vases, glass objects, and everyday tools used a long time ago, along with sacred inscriptions and gravestones dating back to the birth of Christ. 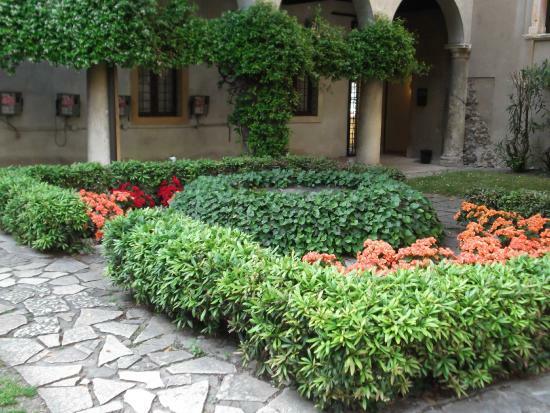 Relax in the sunny, green garden of the cloister, away from the noise of the city streets. Head through the chapel and continue until you reach the museum’s large terrace, which offers a breathtaking view over Verona. Since 1948, the theater has been home to the Verona Jazz Festival, which takes place over the summer. Book ahead! This restaurant is just above the Roman Theater and can also be reached by car from the center of the city. This is the ideal place for lunch, a sunset dinner, or just a simple drink. 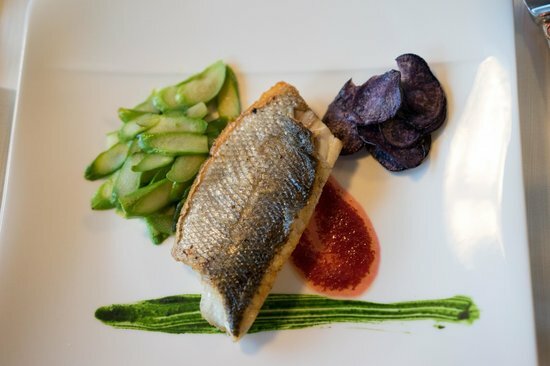 A breathtaking view from the panoramic terrace is guaranteed, the service is quick, qualified and efficient, and the food menu and wine list is sure to satisfy every taste. The only problem will be that you will not want to leave! 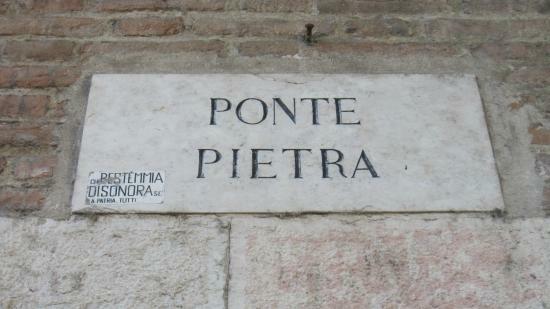 If you come by car, there is free parking available just two minutes away, near to the San Pietro Castle. 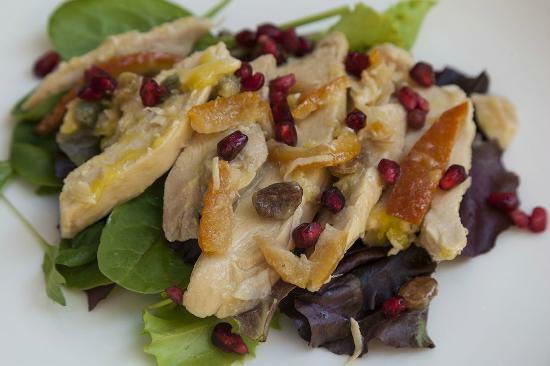 The cocktails and fresh juice recipes are delicious, so don’t leave without ordering one! 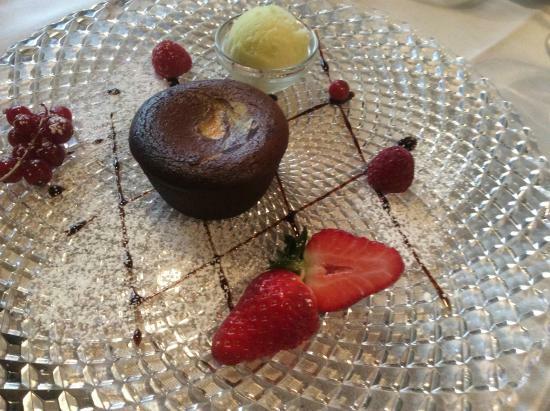 There is an extensive wine menu from which connoisseurs may choose their favorite. "Cin Cin," as we Italians would say! We are now climbing the many steps that take us to Castel San Pietro, but the exercise is well worth it. This is one of my favorite spots in town and the view is just amazing; a magnificent and utterly romantic city viewpoint for a memorable photographic session. Best of all, it is completely free! Remain in awe at the esplanade in front of you and just take in the view. You can see the castle only from the outside, visits are not permitted inside. 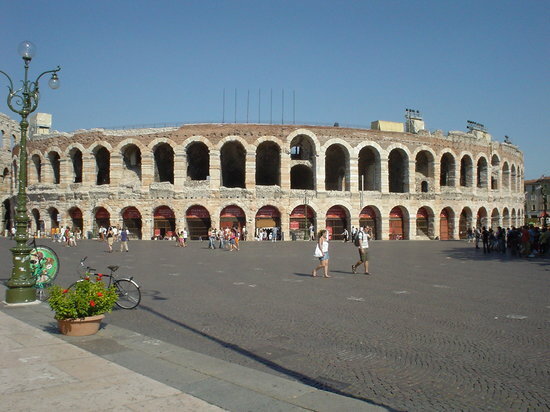 This site is also a stop for Verona's sightseeing bus which runs all day up here. The castle can be reached on foot after crossing the Ponte Pietra, or by car, passing by the back of the hill. 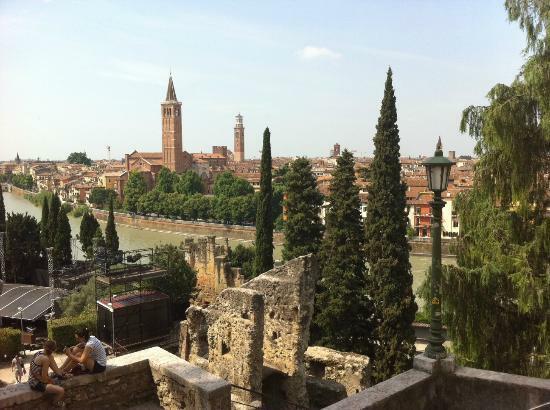 This is a very popular place for couples in Verona who come here to watch the sunset. Let love lead the way! 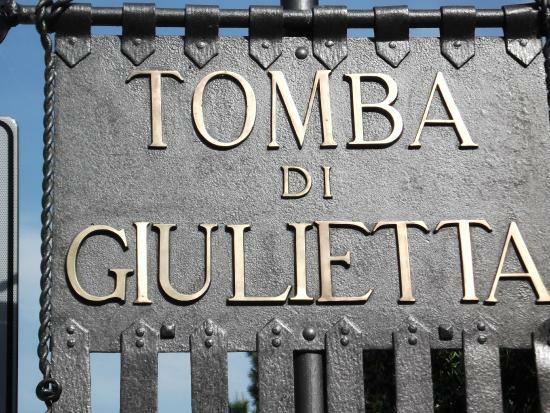 This ancient Roman gate dates back to the 1st century AD and is located very close to the city center, five minutes away from Piazza delle Erbe. It used to be the city’s main entrance and its modern name derives from the word 'bursarii,' which refers to the people who once collected custom duties from anyone who entered the city for commercial purposes. 'Borsa' means ‘bag’ in Italian and that’s where the bursarii used to put all the money they collected from traders. Talk about Italian bags! Look closely at the walls of the building to the left of the gate and you will see some preserved Roman walls that are still visible today. The Roman walls you may have noticed were used as the foundation for buildings erected here in the 17th century. 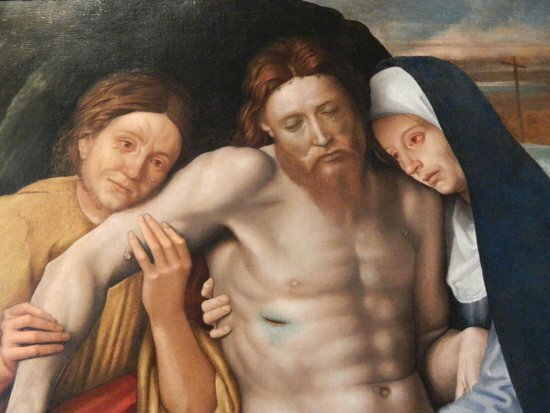 Once a military fortification, the Castelvecchio Museum is nowadays one of the most important museums in Verona, housing one of the most exquisite collections of Italian and European art across its 29 rooms. 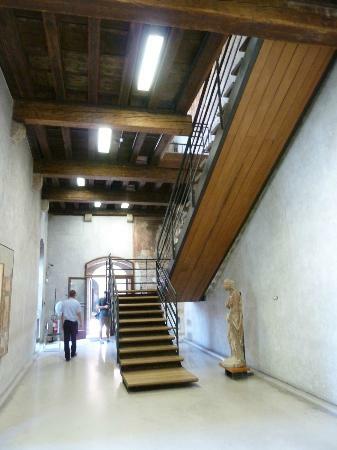 It was restored by the famous Italian architect Carlo Scarpa between 1957 and 1975, and currently boasts an impressive selection of sculptures, paintings, antique weapons, ceramics, old jewelry, and ancient city bells. There is also a more recently constructed part of the museum, called the Napoleonic Wing, which today houses The Museum of Modern Art. From the top floor of the museum, it is possible to get some fresh air and take a walk between the battlements of the castle. 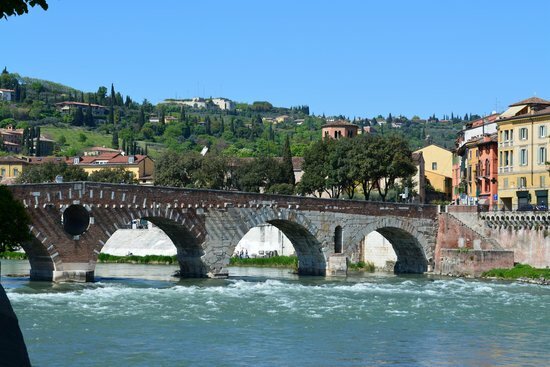 You can visit the castle’s bridge and cross the Adige River for free. Lots of locals use this route to get from one part of the city to the other. The wonderful bridge adjacent to the castle was actually an escape route and is now one of the best spots in town for photographers. Take out your camera and start shooting! Just across the bridge, get ready for a delicious Italian pizza dinner. Pizzeria Vesuvio makes the best integral flour pizza in the whole world. That's amore! The statue of Liang and Zhu just outside the entrance was donated in 2008 by the city of Ningbo, the place where the legend was born. 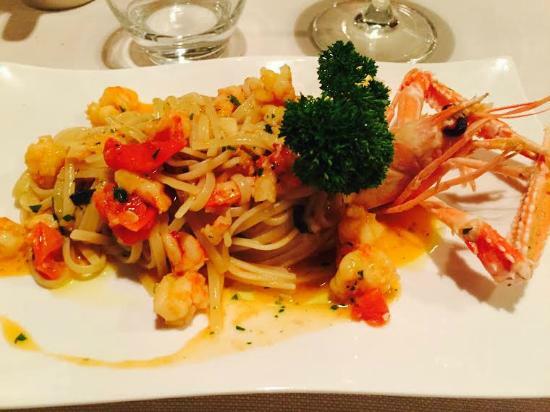 The restaurant is located very close to the main attractions in Verona, so if a full lunch or dinner doesn't do it for you, you can stop by for an aperitivo at any point during your itinerary. Quality is guaranteed, but grandeur comes at a price.